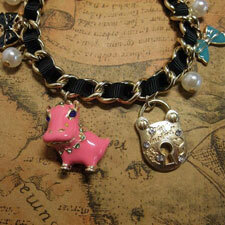 A black ribbon runs through a gold-toned chain link bracelet accented by dangling charms including a chunky pink or orange hippo with pearls and bow ties and a wish lock. Bracelet length: about 7" (17.5cm). Hippo charm size: about 7/8" long by 3/4" wide (2.3cm by 2cm). Lock charm size: about 1" long by 5/8" wide (2.5cm by 1.5cm). Please choose from a pink or orange hippo.